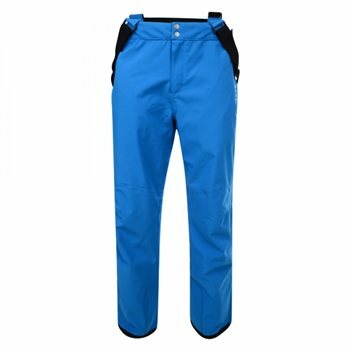 The men's Certify from Dare 2b is a great mid-level bibbed pant for snow sports. Made using seam-sealed ARED VO2 15,000 coated fabric with stretch built in, they offer waterproof and breathable protection with plenty of mobility. snow gaiters and cuff zips give a close fit around your boot to stop the powder sneaking in while a handy hem tab helps protect them from muddy car parks (and apres-ski). Garments engineered with Dare 2b’s Ared fabrics provide truly durable waterproofness, keeping water out through prolonged use in harsh conditions and demanding terrain. We measure the waterproof level or hydro static head of all our garments and offer a full hierarchy of performance, starting at 5,000mm all the way up to 20,000mm. All Ared products are classified as truly windproof and hold up against the most demanding standards, which help to preserve the body’s thermo regulation and keep the user comfortable. Breathability is also key for reducing overheating and perspiration build up. Ared products allow sweat to pass through and escape in the form of moisture vapour. We ensure under testing that during heavy exertion our fabrics must breathe well to a standard of 10,000/m2/24hrs. Several of our premium performance garments are engineered utilising stretch technology making them ideal for high energy activities by providing uncompromised freedom of movement. The use of stretch fabrics also means each garment contains less material and therefore reduces weight and bunching of excess fabric. Our Ared garments have been tested in real-life conditions extensively. If you are not satisfied with any of Ared products we will repair, replace or refund your purchase for up to 3 years.